Foundation funding for human rights comes from scores of large and small grantmakers located around the world. Some of these foundations are well known for their human rights focus, while others may think of themselves as "social justice" or "progressive social change" funders. Still other foundations do not explicitly support human rights or social change. But all of the foundations included in the Advancing Human Rights: The State of Global Foundation Grantmaking report share one commonality: they have made at least one recent grant for organizations or specific efforts that seek to advance human rights based on the human rights definition adopted for this report -- a definition consistent with the Universal Declaration of Human Rights, the first United Nations declaration to outline the basic rights and fundamental freedoms to which all human beings are entitled. 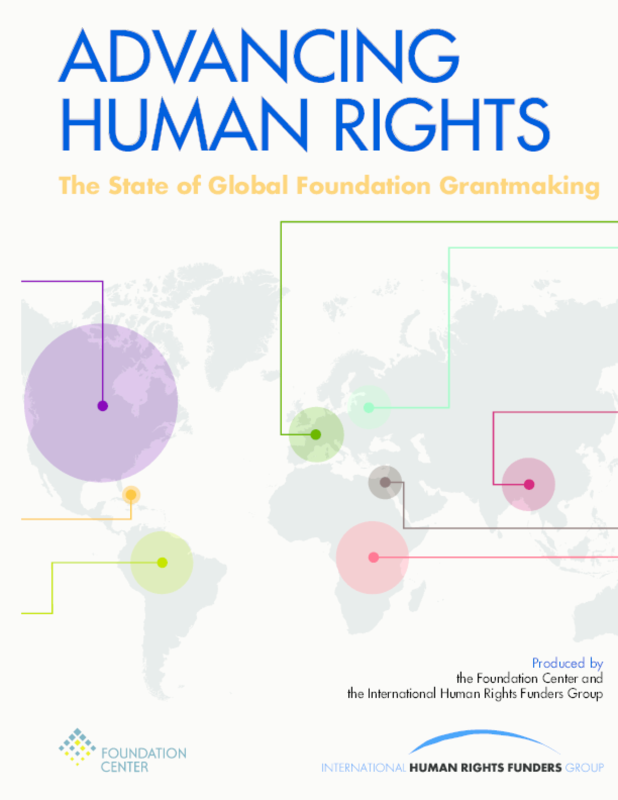 Many of the foundations in this study have made dozens or hundreds of grants to advance human rights. The Foundation Center and the International Human Rights Funders Group (IHRFG) have partnered on this first-ever examination of global human rights grantmaking. Our goal is to build understanding of the current landscape of foundation support for human rights and begin to track changes in its scale and priorities and trends going forward. Grantmakers seeking human rights funding partners and learning opportunities, non-governmental organizations (NGOs) and allies working in the human rights sphere, and bilateral and multilateral organizations undertaking complementary human rights endeavors will all be well served by this research. For those considering human rights-related grantmaking for the first time, this publication offers an accessible introduction to the field. Through the ongoing collaboration between the Foundation Center and IHRFG, with the assistance of Ariadne/European Human Rights Funders Network, the International Network of Women's Funds (INWF), and other grantmaker networks and individual foundations, the Advancing Human Rights initiative will provide knowledge resources to help secure and strengthen the rights of innumerable people around the world.